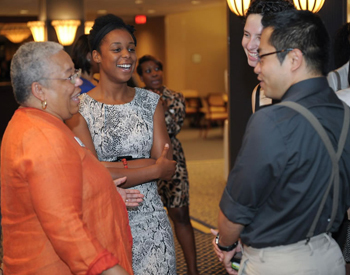 Students, faculty and staff gather last fall for a networking reception for the fullCIRCLE mentoring program. In an effort to engage students simultaneously across their social identities, the four cultural centers within the Division of Student Affairs (Disability Cultural Center, LGBT Resource Center, Office of Multicultural Affairs and Slutzker Center for International Services) are working together with the Office of First-Year and Transfer Programs to welcome new and returning students, faculty and staff to campus. Collectively, the cultural centers are hosting an open house on Aug. 29 from 3-5 p.m. in Schine 304ABC. As part of Syracuse Welcome programming, the open house invites all students, faculty and staff to stop in at any point during the event. Students will be able to interact with a diversity of faculty and staff, in an effort to create sustaining connections of support, and to nurture a greater sense of belonging. Additionally, each cultural center will have information about their respective programs and services available to those in attendance. Refreshments and American Sign Language (ASL) interpretation will be provided. Request for accommodations can be directed to Diane Wiener, director of the Disability Cultural Center, at dwiener@syr.edu, by Aug. 22.